U.S. Debt Crisis: What’s the End Game? 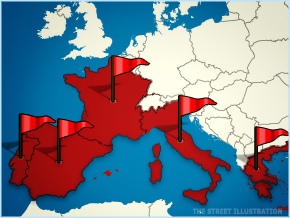 NEW YORK (TheStreet) — It is pretty much settled that the European Monetary Union, as it is now constituted, cannot survive. It is just a matter of whether the course of events will be disruptive, or will be coordinated by the European leaders. Given what we have observed over the past year-and-a-half regarding their unfolding debt crisis, I suspect the former. We may even see bank runs, frozen credit markets, plunging equity values and other ugly stuff if the political forces there don’t get their acts together real soon. But, let’s not be so naïve as to think that we, in America, are immune from a similar scenario. No, the dollar isn’t going to break down into a set of regional currencies, although I do suspect that the coming QEs (3, 4, 5…) will significantly lower its value. What I am talking about is the inability of the U.S. political system to effectively deal with the economic imbalances that have developed in America, mostly in this century. By always kicking the can down the road, as only the skilled politicians in Europe and America can do, they assume the risk that the inevitable changes that must come to restore balance will be disruptive, even violent, rather than controlled and coordinated. Nov. 23, 2001 — that is the next critical date for the financialmarkets, as they hang on the pronouncements of politicians, in this case, a subset of the U.S. Congress dubbed the deficit super committee. We have recently witnessed the skill with which Europe’s political leaders manipulated market sentiment each week as they continually showed their mastery of the art of can kicking. In the U.S., progress on its own debt crisis should be much easier to achieve than in Europe, as only two sides have to agree, as opposed to 17 disparate and culturally diverse entities that form the European Monetary Union. But, because we are only 12 months from major U.S. elections, real progress on deficit reduction is unlikely. The U.S. debt crisis will surely be kicked further down the road. Even in the unlikely event that the deficit super committee finds the $1.2 trillion to $1.5 trillion that they are looking for (there appears to be a bipartisan subgroup within the super committee pushing for such a result), such cuts will be placed in the out years, only to be recast, manipulated, or simply forgotten or ignored by the next generation of the political elite occupying the halls of Congress in 2021. Further, in reality, $1.2 trillion to $1.5 trillion is only a drop in the bucket of the spending problem in Washington, D.C., and, even if agreed to, won’t make much of a difference except to instill some hope in the equity markets, perhaps enough for 300 or 400 Dow points on or before Nov. 23. In reality, the underlying social and economic issues in the U.S. are not really different from those of Greece, Italy, Portugal, Spain or Ireland. They revolve around overpromised entitlements and a rapidly developing entitlement mentality, overpaid government workers, an elite class of wealthy, a broken financial system, a business climate stifled by government regulations, a dwindling middle class, and an over-indebted consumer with a shrinking real income. We all recognize these as underlying causes for Europe’s sovereign debt crisis, but each and every one of these is a huge issue in America, none of which are likely to be addressed by the super committee, or, for that matter, by any committee until at least 2013. Ultimately, failure to address these issues will cause a social backlash. It may well be through the regular political process, but the more the can is kicked down the road, the more likely it is that the social unrest will demonstrate itself through another process altogether. The Occupy Wall Street movement is but a canary in the coal mine. An interventionist government that picks the winners and the losers (Too Big To Fail banks, GM, Solyndra, wind and solar energy) with its army of rule makers, attorneys, and income redistributionists rather than allowing the free market, which gave America its greatness, to choose. So far, the Washington, D.C. elites have relied on traditional Keynesian means of deficit spending or interest rate manipulation to address some of these issues. But those measures simply do not work. Total debt is already too large, and creating more of it doesn’t help. And, the Fed is now impotent. As Bill Gross recently observed, lowering interest rates will not make U.S. manufacturing more competitive, doesn’t change the dynamics of a retail trade industry impacted by internet shopping, and actually hurts seniors and retirees trying to live off of investment income. Like in Europe, the ultimate end game in the U.S. will be rebalance. The resolution of the above-mentioned issues can still be addressed within the existing political framework in a peaceful, well thought out, and coordinated way. But, if the can kickers in Washington, D.C. refuse to tackle those issues, they will be taking the risk that the inevitable rebalancing will occur through a disruptive and/or violent process.